This is my non-series series on understanding the legal structure of the U.S. for genealogists. The reason this is not a series is because I am going to approach the subject from a lot of different directions, but the common theme will be using the vast collections of legal and law related records to do genealogical research. In my last post, I pointed out that there are three major law related parts of our government; the judicial system and all its attendant parts, the legislative system with all its support organizations and agencies, and the executive structure with all of its regulations and rules supported by all of its agencies. You may well ask why I consider all three of the divisions of our government to be part of the law? All of our government in the U.S. ultimately derives from the structure created by the U.S. Constitution. Every government body, agency, office, and those working for the government, ultimately hold their positions either because their existence was authorized by the Constitution or created pursuant to powers granted by the Constitution. All government records were created or are maintained due to some sort of regulation. In a real sense, it is the Constitutional law of the country that creates the structure of our society. From my perspective, all government documents exist because of some legal requirement. You could divide the documents into categories by the branches of government, but that ignores the fact that ultimately none of the records would have been kept had there not been some rule or regulation requiring the existence of the records. From a genealogical standpoint, these legally derived records have been maintained since there have been governments to mandate record keeping. Even before the adoption of the U.S. Constitution and the formation the United States of America, the various governments of Europe, England, France, Spain and others, mandated record keeping in some form or another. The division I make is between records that are mandated by some sort of law or rule, and those records outside of the government venue i.e. privately maintained records. Private records were maintained because of personal or societal interest in record keeping. Private records could be anything from a personal diary, a private letter, a Bible entry, church records, newspapers, books, in fact any document or record that is not mandated by law. Why the division? Usually, with private records there is no legal responsibility to preserve or protect the record. Anyone who can find the record can usually gain access. There is no requirement that the records be gathered in any particular place and to some extent their preservation is a matter of chance. This is entirely different for public or legally derived records. Usually, a specific person or agency has responsibility for the record and all of the records are kept as mandated by law. This does not mean that records are not lost, the 1890 U.S. Census is prime example, but it does mean that to some extent, the location of the records is determined by present or prior laws and statutes. Private records may be anywhere; basements, attics, libraries, museums, but public records are more likely to be in designated repositories. This is not necessarily 100% true, because some individuals may have improperly maintained or taken public records. We had an example of this in Arizona where a court reporter had all of the court records in his home. He not only lost his job, but was also arrested and prosecuted for disobeying the law. Also, the preservation of records by the various government agencies (in the broad sense) may or may not be done properly. This is important to understand from a genealogical standpoint, because you are going to find government documents in an entirely different way than you would if you were looking for privately maintained documents. My next post on this subject will look more closely at how government documents are created and why they are maintained. Even among highly educated members of our society, there is little understanding of the basics of our legal system outside of the practitioners. Over the years as I prepared for trial after trial in our courts, I was always amazed at the amount of misinformation my clients seemed to have about the process. It is my experience now, after years doing genealogical research, that the genealogical community is no different than the general public in their degree of lack of understanding of judicial, legislative and executive processes. The results are that few researchers use the vast amount of genealogical information available from our legal system. Of course there are always exceptions, but over the last year, for example, I cannot remember one instance of a researcher asking a question about anything associated with the legal process. The lone exception is in the narrow area of wills and probate. But the amount of paper generated by our legal/legislative/executive system is immense and much of the information can be helpful in researching your family lines. That is the good news. The bad news is that most of the valuable information is locked away in law libraries, government record repositories and huge online legal databases. So where does our law come from? As I have referred to above, our government is roughly divided into three major subdivisions. Our judicial system whose practitioners include judges, lawyers and all of the myriad of people who work with and for the courts and the law offices. Our court system is complex, with judges and courts at all levels from the U.S. Supreme Court down to the smallest justice or small claims courts. Lawyers are divided into two broad categories; those that work for the government and those that work for the private sector. Lawyers are further divided into other broad categories by the type of cases they work on, either cases involving the state, usually criminal cases or cases involving private parties, usually called civil cases. This discussion of the divisions of the law could go on and on into a book of thousands of pages. This is part of the problem, the law, even in its most basic form is tremendously complicated. For example, while I was in law school, we estimated that we were required to read in excess of 20,000 pages of law every semester and that was if you just wanted to keep up, not actually learn anything. I know people who haven't read five books in their entire life. Another of our legal system comes from the laws (statutes) passed by our various legislatures. You cannot begin to imagine all of the information generated by the various legislative (law making) bodies in our country, beginning with city councils all the way up to the U.S. House of Representatives and Senate. Just one tiny example, much of the genealogical data from the New England States is found in town council records of different types. The third big division of our legal system is the executive branch. Here we find most of the people who work for the federal, state and local governments. We also find codes of regulations, rules, and procedures that govern how we live in the U.S. Along with these rules and procedures, these agencies gather a great deal of information, some of which is valuable to genealogists, if they know it exists and how to find it. The amount of information all of the levels of the executive branch collectively generate, from the street sweepers and sanitation workers to the President of the U.S. is overwhelmingly monumental. Although the National Archives only preserves from 1% to 3% of all of the federal records, its collections are enormous. Think of all the local records from sales tax returns to parking tickets and then think how many jurisdictions there are in the U.S. creating records. When was the last time you looked and the records of the National Forest Service? Have you ever searched congressional records? When was the last time you looked in the free Archival Research Catalog? Have you ever use WestLaw.com or LexisNexis.com for genealogical research? Can you imagine how valuable these resources are? Notwithstanding the fact that they are ridiculously expensive? This is the start of a series where I will highlight some of the more valuable and almost never used types of records that are generated by our government's legal system. Facelift for FamilySearch.org Home Page? The page that came up today was totally redesigned and had a lot more information and graphics. But it seems to have disappeared again. Must be something in the works. How do you start your genealogy? Then there is a whole different challenge. My experience with the second group is spotty and frustrating. Usually they have some specific motive for finding their family. In some cases they are trying to find the identity of a parent, such as a missing father. In some cases in Arizona, they are trying to establish an Indian ancestor so they can enlist in a tribe or reservation. Often, they are interested to see if they are related to a famous person, although some will not admit this desire. Others have a real interest in their family but aren't ready to put forth more than a modest effort. These people sometimes come into the Family History Center and ask to have their genealogy printed off for them and it takes quite a while to convince them that we can't just push a button and see their "genealogy." Most of these people are not at all interested in doing research. The minute I turn on a computer and start to show them how to find their family members, they lose interest and walk out. They are under the impression that we will do all the work for them for free. Occasionally, I will help someone who really wants to learn and is motivated to do some work. In this case, I do start with a paper pedigree chart, just to give the person and me some idea of the what they should do. Some of these people stay and work hard at finding their ancestors and soon start taking classes and learning some computer skills. Motivation is a great thing. The advantage of having a program like New FamilySearch, for those who have access, is that the program will already have any existing pedigree information the person's family may have submitted, for free access. That means they can go home, log in and look at what is there. To do this however, the person has to be pretty well into the first group. Among the members of The Church of Jesus Christ of Latter-day Saints, (Mormons) even though New FamilySearch has now been around for years, there are huge numbers of members who have not even logged on to the program one time and an even larger number who have logged on once or twice but never looked at the information. New FamilySearch is a good program for beginners, if they begin. It only gets frustrating after you have been working with it for a while. Yes, you do start with what you know. Yes, you do gather information from your own records and immediate family members. Yes, you do start with a simple pedigree chart and fill in the blanks and no, this type of newcomer will not have the same experience as my three ladies had. But my guess is that everyone will eventually get to the point where they realize that genealogy is complicated, difficult, time-consuming, interesting, absorbing, addictive and worth the effort, if they will only keep at it for a while. Digitizing Photos -- How much resolution is enough? Most of the literature on digitization talks in terms of dots per inch (DPI) which no longer has any real meaning outside of laser printing and similar applications. A more descriptive measurement is pixels per inch (PPI) but this measurement is for images expressed in pixels. Technically, resolution or sharpness of an image is characterized by a parameter called Modulation Transfer Function (MTF) also known as spatial frequency response which is the response of an optical system to varying intensities of light. This becomes very technical very fast, but is a way to measure the resolution of lenses and other optical devices such as scanners based on the resolution of a standard scale of lines per inch or lines per millimeter. I am really talking about two different things. One is the resolution of a digital camera and the other is the resolution of a scanned image of developed and printed photograph. If you are taking a digital photograph it makes sense to capture all of the information you can from your camera. In photography, the easy answer is saving everything in Camera RAW. Raw files are so named because they are not yet processed and therefore are not ready to be printed or edited with a bitmap graphics editor. With Camera RAW (not an acronym) you get the maximum pixel count of the camera because a RAW image is everything captured by the camera. End of story. But here is the catch, not all cameras save images in Camera RAW, most cameras default to JPEGs. The quality of the image you get with a digital camera depends entirely on the quality and the resolution of the camera's sensor in pixels (Megapixels) and the quality of your lenses. If you want better pictures, you buy a better camera and lens. For example, a Canon 28-70mm f2.8L lens is very highly rated but the lens alone costs around $1,300. The easy answer for scanning existing images is to scan everything into TIFF (Tagged Image File Format) files. TIFF files are uncompressed and lossless and most scanning software will allow you to save your scans in TIFF format. In either case, the file sizes are considerably larger than the equivalent JPEG file. The main file size concerns today come from sending files over the Internet or posting images online. In either case, it is a rather simple matter to re-save the larger image as a JPEG and use the smaller files size for online sharing. For example, I have a Camera RAW image on my computer that is 22.5 MB in size, if I develop the image, so to speak, and save the same image as a TIFF file, the size of the image jumps to 63.1 MB. But if I save the same file as a JPEG, the image drops to 5.3 MB. That isn't magic, there has to be a loss of information from the file to make that big of a difference. Why should I care? I have a problem with the idea of losing data. I can't go back and take a picture over again and I don't want to scan pictures again. With photos from my camera, I can go back to the same place or I can gather the same people but the picture can never be duplicated. Children grow too fast, people die, people move away. How may of you wish that you had a better picture of your grandmother or someone else in your family? Once the data is lost, it is lost. So I always have an incentive to purchase as high a quality camera and lens system as I can afford. Scanning introduces a whole different set of concerns. Following my thought line about photography, shouldn't you just scan everything at the maximum level your scanner can handle? Well, not really. A photograph already has a limited amount of detail i.e. information. Scanning at higher and higher resolutions may not always produce a higher quality image. Wait a minute. Isn't that a contradiction of what I have already said? Yes and no. Think about it. Once a photograph is printed in whatever format, The amount of information in the picture is already established. Although most modern photographs had a reasonably small grain size, you can enlarge any photograph to the point where the individual grains of the photo are visible. There is another limitation, the ability of the human eye to resolve details. Higher and higher resolution may exceed the ability of the eye to see any difference. The human eye can resolve only about 6 to 8 lines per mm from about 10 inches. So there has to be some point at which scanning an image from a photograph reaches a practical maximum level. Would you be surprised to know that there are also physical limits caused by the interference of the light waves also known as diffraction. See Resolution and MTF curves in film and lenses by Norman Koren and Image Detail, How much detail can you capture and scan? by R. N. Clark. Diffraction limits the amount of detail any imaging system can obtain due to the nature of light waves. There are two systems for measuring the diffraction limit of an optical system; the Dawes Resolution Criterion and the Rayleigh's Resolution Criterion. Look these up if you want to know more. What does all this boil down to? A sharp photographic image will contain about 400 pixels per inch although you might go as high as 600 ppi. You can scan at a higher resolution but there will be little, if any, increase in the resolution of the final image. As a final note, scanning printed or handwritten documents has an entirely different set of criteria. 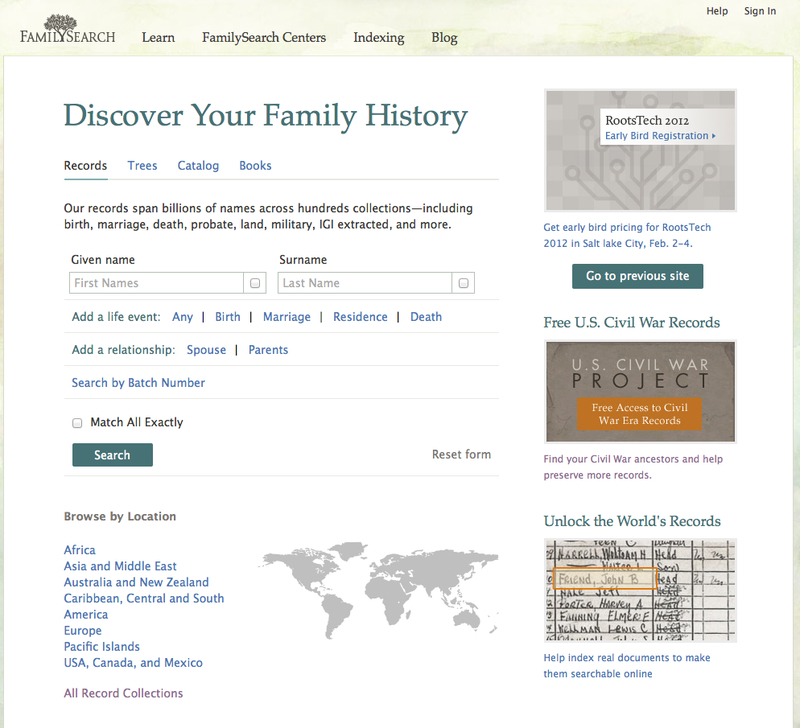 What would my ideal online genealogy site look like? I spend a lot of time looking at online genealogy data sites. Now I don't mean just backing up your data. data storage is data storage, who cares what the site or the data looks like. No one is going to look at my online storage. Where I start with this analysis is with sites like New.FamilySearch.org, Ancestry.com's Family Trees, MyHeritage.com, TribalPages.com and other such sites. To start out, I need to make a disclosure. I like WeRelate.org. That site comes as close to my ideal as any site out there so far. So what are my criteria? Before going too much further, I have to say a subscription site is not a total deal breaker. Having a free site is a plus but not even one of the major considerations. For the record, I have a subscription to Ancestry.com and I have my data on MyHeritage.com. Disclaimer, I have not looked at all of the dozens (hundreds?) of online database programs. I mention these in this post due to the fact that I have some reason to become acquainted with the programs. If you know of a program that fits my criteria, by all means, let me know. 1. The site has to allow for an integration of the data in a way to avoid duplication. Most of the "Family Tree" type online programs let you put up your file in your own family tree. Good news and bad news. I realize a lot of people use one of these services as their primary data program. I don't. I like my data on my computer with my backup. When I loaded my data into Ancestry.com's Family Trees, there were 8,809 family trees with one of my Great-grandfathers. Having your data in one of these trees is not my idea of convenient. How can I possibly determine if any one of the over 8,000 family trees has some kernel of data I need? Especially since only a vanishingly small percentage of the trees have any sources and this is on Ancestry.com where all you have to do is click a few times to get sources. I have already talked too much about the duplication in New.FamilySearch.org. That site has hundreds of duplicates of my Great-grandfather and everyone else in my family. How can I possibly tell if someone has valuable information with all those copies? 2. The site can't be overwhelmingly messed up. I could go on for a while about New FamilySearch, but this time I am going to mention MyHeritage.com. According to MyHeritage.com, I am managing three different family websites, two of which I have never heard of before in my life. I have also added 41 photos to a Family Album some of which are of people I do not know and have never seen before. I have no idea how the pictures got onto MyHeritage.com. I must say, however, that the site has sources, it allows for pictures and it does make a lot of suggested links to relatives. Ancestry.com has hundreds of duplicate trees and most are totally without citation to sources. By the way, TribalPages.com and WeRelate.org are not messed up. 3. The site has to have the basic ability to cite a source and attach the source to a specific life event. I admit, some of the larger family tree programs do this quite well some do not do this at all. Ancestry.com does, MyHeritage.com does not and neither does New FamilySearch. Both TribalPages.com and WeRelate.org also allow you to apply source citations to specific events. 4. The site has to allow integration of media, such as scanned or digitized images and allow for sources and citations of the images. Ancestry.com does this automatically to some extent. New FamilySearch doesn't yet have the capability to add images. The only program that gives you a huge ability to source images and add citations is WeRelate.org. 5. The site needs to have some promise of longevity. All of the ones I have mentioned fit into this category, but subscription sites have the potential of either pricing themselves out of the market or disappearing due to acquisition or whatever. WeRelate.org is a non-profit foundation sponsored by the Allen County Public Library in Ft. Wayne, Indiana. FamilySearch would be ideal in this regard, if the New FamilySearch website were modified to eliminate most of the present problems and short falls. These are the most important criteria. Perhaps you know a site that I can look at? I will review any suggestions in future posts. The subject of subscription or pay for use genealogy websites is rather controversial. There is apparently a substantial number of genealogists feel that access to all records should be free. There are those who justify charging for access to records by reason of the cost of maintaining a website, cataloging or indexing and other overhead items. Back in 2006, the U.S. National Archives and Records Administration developed a strategic plan for making all of the government records in the Archives available online to the public. As the NARA acknowledges, "Our archival holdings number more than 10 billion pages of unique documents, many of them handwritten, and include formats such as maps, charts, aerial and still photographs, artifacts, and motion picture, sound, and video recordings. The records we hold belong to the public and our mission is to ensure the public can discover, use, and learn from the records of their Government." So how is it that you have to pay some online subscription service to view the records you own as a member of the public? Rather than do the digitizing itself, the NARA implemented a plan to allow third parties to digitize the records. Here is the statement about the projects from the strategic plan, entitled "Preserving the Past to Protect the Future: The Strategic Plan of the National Archives and Records Administration, 2006-2016. Provide online access to an increased number of our holdings. Enhance preservation of records by reducing wear and tear on the originals for reference and reproduction. While digitizing for access has some preservation benefits, it is not the same as preservation digitizing. We will not destroy or de-accession any originals that are digitized for access. Enhance users' understanding of records authenticity and archival context (e.g., who created the records; why were they created; how were they used). Use resources effectively. For example, original records that have been digitized may be relocated to less expensive archival storage locations. Partnerships, where the partner provides resources for digitizing, would expand the scale of digitizing beyond what NARA itself can do. Improve our service to customers consistent with their evolving expectations and with consideration of NARA's available resources and customers' willingness to pay for value-added or convenience services. Promote equitable access to Government information by the public. Here is the key to the answer to the question about why you have to pay for free government documents is in the phrase, Partnerships, where the partner provides resources for digitizing, would expand the scale of digitizing beyond what NARA itself can do." and the next statement, "Improve our service to customers consistent with their evolving expectations and with consideration of NARA's available resources and customers' willingness to pay for value-added or convenience services. (emphasis added). NARA will establish partnerships with organizations from a variety of sectors (private, public, non-profit, educational, Government) to digitize and make available holdings. Partnerships present an opportunity for increased access to historical Government information through the increased availability of information technology products and services. Partnerships will enable NARA to make more digitized holdings available than we could on our own, because the partner will bear most of the expense of digitizing. The products of these digitizing partnership efforts may also include value-added services and features provided by the partner, such as searchable text and detailed indexing, and, as such, are not considered NARA Government electronic information dissemination products. However, partners may not claim copyright on the digital images. Note that these partnership entities "may not claim copyright on the digital images." Have you ever seen a notice by any of the partners that they do not claim a copyright to the images? Have you seen a copyright notice at the bottom of every page of the subscription databases? Have you noticed that the search pages showing the documents, like the U.S. Census records for example, is missing any copyright notice? Did you ever see a statement made by any online service calling attention to the fact that they do not claim a copyright in the federal documents? So now you can see why you have to pay to see some of the digitized copies of the free, publicly owned U.S. documents. Does any of this make sense? Wouldn't you like to get your product free from the government so you could sell it to the public? If I were a builder, wouldn't it be nice to get all of my raw materials, wood, dry wall, pipes, fixtures etc. free from the government so I could build houses and so the material owned by the public would be equitably accessible? Is Genealogy a Product or a Commodity? Or both? A product is an article or substance that is manufactured or refined for sale. A commodity is a raw material that can be bought and sold. As a genealogist, your efforts to research family lines has become either a product or commodity (maybe both) to be bought and sold. Here is a quote from the press release announcing MyHeritage's acquisition of FamilyLink.com and WorldVitalRecords.com, "We are delighted to join forces with the talented FamilyLink team in Provo to deliver meaningful value to families across the world,” says MyHeritage CEO and Founder Gilad Japhet. “Combining close to one billion family tree profiles on MyHeritage with FamilyLink's massive library of historical data delivers a perfect one-stop-shop for families looking to discover and share their family history". Just substitute a few words and you have Google's acquisition of Motorola Mobility and I quote from their press release, "The acquisition of Motorola Mobility, a dedicated Android partner, will enable Google to supercharge the Android ecosystem and will enhance competition in mobile computing. Motorola Mobility will remain a licensee of Android and Android will remain open. Google will run Motorola Mobility as a separate business." And you thought you were doing your own genealogy? No, you were providing MyHeritage (or Ancestry.com or whatever) with their product or commodity (I am not sure quite where genealogical data fits) so that they can acquire other businesses and "provide meaningful value" to their customers. All of us "genealogical consumers" will of course have our meaningful value enhanced. Look what happened to Footnote.com recently as it became Fold3.com. Did you see how your meaningful value was enhanced? Here is a quote from the press release for Footnote.com (now Fold3.com) from 2007, just a few short years ago, "In January of 2007 iArchives in partnership with the National Archives announced the launching of a new site, Footnote.com. This Internet site would be a repository for indexed historical documents that would otherwise be unavailable online. FOOTNOTE REGISTRATION will give the subscriber full access to all historical documents along with the interactive side of the site. This side allows for user contributed content and for interactive connections to site content!" Try and find this laudable goal on the Fold3.com website! The reality of the matter is this, numbers. Online companies like MyHeritage.com and Ancestry.com grow by adding paid users. The larger the number of users, the more income in a direct relationship. If MyHeritage.com adds X-number of additional users by purchasing WorldVitalRecords.com then it can add that much more income. Interestingly, in some cases, you are paying to access documents that would otherwise be free, you are also paying to store your genealogical data online, when you could do that for free also. Now, is all this necessarily bad? Don't you and I benefit from Ancestry.com and all the other subscription sites? Of course we do or they wouldn't have the money to buy each other. But what is the ultimate price? Do we really want all of the world's family related, genealogy related information locked up in multinational conglomerates? Do I see a problem with large corporations taking "free" government records and selling them to me at a profit? Do I see a problem with governments doing the same thing? I am more than vaguely uncomfortable with what is going on. What happens when one of these large record companies goes out of business due to economic conditions? What happens to all the records you have in your online family tree? What happens to all the records they have in their huge databases? Next, another viewpoint about the National Archives and Records Administration's Strategy for Digitizing Archival Materials for Public Access, 2007-2016. Time for more hand-wringing and worry? MyHeritage announces the acquisition of WorldVitalRecords. In fact the news announcemnt indicates that MyHeritage purchase all of FamilyLink.com. In past posts I have reviewed the ownership of the larger genealogy based companies. Just in the short time I have been involved in looking at the genealogy landscape, there have been some major acquisitions and consolidations. Ancestry.com purchased Genline.com and Footnote.com (now Fold3.com). Ancestry.com had previously purchased ProGenealogists.com. Now, MyHeritage.com, the huge online family tree company has made a move into the document side of the business. MyHeritage.com is funded by Accel Partners. MyHeritage has purchased the following: Pearl Street Software, BackupMyTree.com; European family social network market leader OSN (Verwandt) GmbH; Dutch family network ZOOOF; British family network Kindo.com and Polish family network Bliscy.pl. You might be interested to know that Accel Partners owns an interest in hundreds of companies, you might recognize the following: FaceBook, DropBox, Groupon, MacroMedia, RealNetworks, Spotify, StumbleUpon, Trulia, Veritas and many, many others. What will happen to online records if they are considered to be nothing more than an asset of huge multinational corporations? I need time to think about all this and do some more online research. PROVO, Utah & LONDON & TEL AVIV, Israel- MyHeritage, the most popular family network on the web, announced today the acquisition of WorldVitalRecords.com. This is MyHeritage’s seventh and largest acquisition since 2007. The purchase marks a significant move into the US market commercially and operationally, and will boost MyHeritage’s offering to families with the addition of a vast database of several billion historical records. With offices and staff in Europe, Australia and Israel, MyHeritage will now be adding its first US-based office in Utah, often cited as the family history capital of the world. “We are delighted to join forces with the talented WorldVitalRecords.com team in Provo to deliver meaningful value to families across the world,” says MyHeritage CEO and Founder Gilad Japhet. “Combining close to one billion family tree profiles on MyHeritage with WorldVitalRecord’s massive library of historical data delivers a perfect one-stop-shop for families looking to discover and share their family history“. Founded in 2006, WorldVitalRecords.com is a subscription service which provides access to a huge database of historical content, covering several billion individuals within census, birth, marriage and death records, as well as the web’s largest archive of historical newspapers. This content will deliver new insights and value to the 60 million people who have signed up on MyHeritage in 38 different languages, creating more than 900 million profiles in 21 million family trees. When brought together under the MyHeritage umbrella, the company’s innovative Smart Matching technology will automatically match any of the new historical data to the relevant users’ ancestors and relatives within the family trees. It has been while since I updated my iPhone 4 to an iPhone 4S and I thought it a good time to review the experience. First of all, I have a problem with most cell phones because I am deaf. The iPhone is no exception. The volume control on the phone does not allow me to hear a normal conversation is there is any background noise. I can avoid the problem by using either the earpods or some other device, but it would be nice to have a phone I could hear. I have traditionally worn hearing aids, but don't wear them very often because I spend a lot of time on the phone and I have to take them off to hear on the phone properly. So subsequently, I use a speaker phone almost exclusively. Some of this may not make sense, but if you were me with my hearing problem it might. Usually, if there is an upgrade to a product you can discern some small differences between the updated product and the older model, at least enough to justify the upgrade. I would say that the iPhone 4S barely qualifies as an upgrade in my book. The Siri voice recognition software is just as unreliable and cranky as I expected it to be and most of the other innovations are things I don't use and probably never will. Microsoft went through this problem with its word processing program, Microsoft Word. They kept adding features to features, until nobody could figure out how the program worked. Adding another way of giving me reminders about meetings is not my idea of an upgrade. Hmm. I am sounding a little cranky myself here. I do keep finding apps and settings that didn't migrate from the older machine to the newer one and that is also a bother. The real question is whether or not I would buy an iPhone today, if I didn't already have one? I find that nearly everything I like about the iPhone works on an iPad or iPod Touch through WiFi. I don't need the cell phone charges and data plan charges to do exactly the same thing. The only part of the iPod Touch that would not work is the GPS if there were no WiFi, it can't download the maps from the Internet without a connection. I could buy a cheap lifetime map upgrade GPS + an iPod Touch or iPad 2 and save a lot of money and get by with a simple free cheap cell phone and a basic plan. But would I buy an iPhone 4S if I didn't have one already? If you can't tell, I am avoiding the question with more discussion. If I needed a cell phone, which I probably do, I would spend a good bit of time comparing the iPhone to an Android phone. Since I have done just that, I would be forced to admit that the iPhone still outshines the Android phones in the app department. But the Android phones are catching up rapidly. So far most of the genealogy programs on the iPhone are still not available on the Android platform. So, if I want to do genealogy on the bitty little keyboard that comes with a cell phone, I prefer the iPhone. So I guess my answer would depend on whether or not I felt wealthy enough to have a cell phone with a data plan at all. As I indicated, I don't see this as an Android vs. Apple issue at all, I see it as a cell phone as an Internet device vs. iPads, iPod Touch, ultra-light laptop, etc. Maybe all I need is a phone? But what about all those time I use my iPhone for checking things out on the Internet? Like Red Laser for example. All I have to do is take a picture of a product bar code and zap, I have comparison prices on the Internet, unless, of course, I am in Costco or Walmart or someplace where they have their own special UPC codes. Now that I think about it, there are dozens (hundreds) of times I use the iPhone's connection to the Internet when I am definitely not in range of any WiFi. But would I buy one again? I'm glad I have one for the duration of my contract so I don't have to make that decision. Modern technology has a tendency to be seductive. Unfortunately, it also has the same tendency to be adictive. When does an activity become a habit and when does a habit become an addiction? Do you feel vaguely uncomfortable if you miss your morning email/Facebook/Twitter fix? Or do you actually panic and have an uncontrolable urge to turn on the comuputer and check the latest news and updates? Genealogists are no more immune to tech addiction than any other group or individuals. You may look down your nose and a younger person's constant gaming habit, but at the same time be inseperable from the Facebook stream. You may have resented your mother's addition to soap operas, but now you have the same problem with Facebook. Do you have more than three network connected devices, such as a computer, a tablet, an iPod or a smartphone? Do you turn on the computer or other device before you get out of bed in the morning? Do you find yourself going to be with your smartphone or iPad? Do you read blogs and Facebook while you eat? Do you find yourself in meetings, like church or social events, checking your email or Facebook instead of talking to people or listening to a speaker? Do you have your smartphone on or laptop going while you watch a movie on TV? There are of course other issues. Now we have to ask the ultimate question, is all this necessarily bad? Addictions always have a negative connotation, but isn't there the possiblity that we can become accustumed to a different lifestyle that completely incorporates technology? Is that bad or good? I look at it from the standpoint of production, personal interaction and work. Can I maintain a reasonable level of contact with the real world of friends and relatives and still be deeply involved in technology? Does my tech habit interfere or enhance my ability to pursue my family's history? If I were a journeyman carpenter, I might use a hammer and saw all day, but that does not mean I am addicted to their use. On the other hand, if I spend my days watching the Facebook stream and making comments instead of pursuing some more productive activities, maybe my tech addition is harmful. My Grandfather worked for newspapers all his life. Every day he would come home from work and sit and read the newspaper. I just remember that, I don't feel like that was a problem at all. But had he neglected to speak to any of us or ignored what else was going on, it might have become an issue. Do we all need to evaluated our relationship to technology from time to time? Free Online Complete US Census with INDEX??? Probably not too well known to genealogists, digitized images of the entire US Census, including all the supplementary schedules, documentation etc., has been online for free from Archive.org. To see the US Census records go to the home page and look for the Text records on the lower right. There is a link to Browse and that takes you to a list of all of the U.S. Census images. The format is entirely different than any of the other U.S. Census images previously available online. Essentially, each roll of microfilm from the National Archives has been digitized as is. From some standpoints this is very, very good. For example, you get the feel of how the Census was combined into the various volumes. On the other hand, the census records are just that, the records. There is no searchable index to the images. But wait. Family Tree Magazine in an article that just came out with the December 2012 issue quotes Archive.org as saying that indexes are being added. So where are the indexes? What isn't explained in the article is that the indexes they are referring to is a digitized copy of the Microfilm of the soundex card index to the U.S. censuses of population as collected by the Census Office. Yes, strictly speaking there is an index, but the index is the one done by the U.S. Census office. The really good news is that these soundex cards are being indexes so that they can be searched online. The Mesa Regional Family History Center, the Family History Library and some other locations have had the bound volumes of these indexes for a long time. On occasion, I have found names in the bound indexes that I have not found in either Ancestry.com or FamilySearch.org, but lately, I have really neglected to use this additional valuable resource, probably just because it wasn't on my computer. (Duh). OK, so what does this all mean? It means that those of us too poor or too cheap to use Ancestry.com, can now have our own online free U.S. Census with an index. Pretty neat? Yeah. Now, it is not so convenient to use as Ancestry.com but here is another point, it is an entirely different copy and index to the Census. You just might find things in Archive.org that you can't find in the U.S. Census on any other source. While you are looking at the Census, check out the rest of Archive.org's books and other media. You might just start visiting this site more often. What are beginner's impressions of genealogy? I have been helping three ladies just starting out in genealogy this past week and they had some interesting and consistent comments. In each case their knowledge about what they were getting into was extremely limited. They had no prior experience in doing research and had fair computer skills. In each case, I spent more than the normal few minutes helping a patron at the Mesa Regional Family History Center. One of the ladies spent 2 and 1/2 hours, the others were similar time frames. In each case we were starting out from zero, no names in the computer, except two of the ladies had Personal Ancestral File files from other family members. So what were their initial impressions? The first impression that they all expressed was frustration with the amount of inaccurate information online. 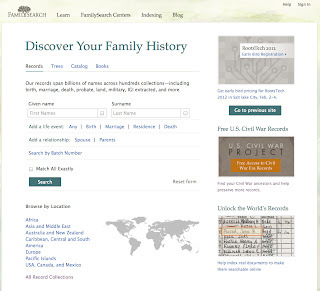 They were surprised that U.S. Census records had the family names spelled wrong and were even more appalled at the mistakes and bad information in New.FamilySearch.org. One of the ladies was surprised that her relatives had submitted obviously wrong information to New.FamilySearch.org which she readily detected as wrong. In every case, each of the ladies were concerned about how they were going to be able to correct the wrong information. They were not happy when I told them that the New.FamilySearch.org program had no accommodation for making corrections to the existing files. In each case, the ladies were concerned about the accuracy of the online information. Once they saw inaccurate information, they were skeptical that the rest of the information they found about their ancestors was accurate. I was repeatedly asked how they could verify the information they saw on their computer screens. Their perception of unreliability was not helped at all by the variations in spelling in various records. Of course, if you have been doing research for years you come to expect spelling variations, but the ladies all started doubting that was they were finding was at all useful. Obviously, the time I spent was not enough to give them an idea about genealogical proof. So they went away wondering how they were going to proceed. After an hour of so, each of the ladies said the same thing, they had no idea how complicated genealogy could be. Their impression was that far from being simple, the longer they spent, the more complicated it appeared. None of the three were ready to give up, but they remarked that they had a lot of homework to do before they went any further. In each case the reaction was entirely different than that portrayed in TV commercials or 5 minute instructional videos. There are those, I am sure, that would fault me for showing them too much too soon. Perhaps I should have just looked up a name in the U.S. Census and left it at that with them having no idea either what I had found or how to duplicate the search. Instead I opted for getting them started entering names into a popular software program so that they could see for themselves the process of entering new information into the program. I believe the experience for each was positive. They all were very happy at the end of the sessions and felt that they had actually accomplished something and had files they could now use to start for themselves. Genealogy is not easy. It is difficult and complicated. There are a lot of different skills used in genealogical research including the basic computer skills. Online information is not always very reliable. You cannot just push a button and come up with a full-blown pedigree. Genealogy could take all your time if you let it do so. Some of the online databases are not easy to deal with because of the errors and duplications. Genealogy is worth the effort and is a real challenge. It was very interesting to see these similar expressions from three very different people. Before about 1980 law offices in Phoenix were entirely paper driven. My workflow included dictating letters to a secretary (now called legal assistants) and then waiting to see the draft, then rewriting the draft and then having the original typed with several carbon copies. We had boxes and boxes of carbon paper. Eventually, the process changed slightly when we got a very expensive copy machine. In the world of Court trials, we were constantly worried about the "original" document, whether it be a note, a contract, a will or some other document. I remember standing in court on innumerable occasions requesting leave of the Court to substitute a copy for the original. Many cases were decided on the issue of whether or not we could produce the "original" document. Fast forward to today. I never do dictation. I type all my own documents on the computer. I haven't worried about an "original" document for some time. We routinely use copies of documents in Court without so much as a comment on the fact that we have a copy not the original. The only Court hearing that are concerned with originals are will probate cases. Our workflow is simple. I type the document. My legal assistant prints it off. I sign the document and she sends it out. The difference is computers. We usually do not make multiple copies, but send the copies by email to the clients and others. Every document that comes into our office is scanned and stored in the client file on a computer. I can look at any document, any time from anywhere. (I wish). What is even more dramatic is that all legal research is done online. I used to spend day after day at the law library. I haven't been to a law library, except to use the restroom, for years. Just recently, the Maricopa County Superior Court ordered that ALL pleadings and documents had to be efiled, that is electronic copies not paper copies are filed with the court. The days of standing in line at the filing clerk are also almost over. Now, if these types of dramatic workflow changes have come to a traditional and very conservative profession like law, what do you think genealogical research will be like in a few years? If you want to know how conservative the law is, look at your personal will, if you have one. Then look at a will written in the 1600s, notice any similarities? Yep, we are still using the same language. I still know lawyers who cannot type and do not use a computer! But they will die off soon. Right now in genealogy we are in the same transition, but for most, they are still struggling with the change from a paper based system to a computer based system. But where is the balance are computer skills going to be the deciding factor or will genealogical skills still predominate? Will there ever be a balance between the two? The Church of Jesus Christ of Latter-day Saints recently began an initiative to involve the youth, with their computer skills, in the world of genealogy. They have a new website called Youth and Family History. One of the areas emphasized is that the youth can help "older" less computer literate people with their online genealogy. Obviously and appropriately, much of what they talk about is religiously oriented, but the core idea here is that younger people have the computer skills to "do" modern or post-modern genealogy. Last time I checked despite the hoopla and ads on TV, genealogy hadn't gotten any easier. It is still a difficult and very complex subject of study. By the way, so are computers. With respect to the youth, I think older people tend to mistake game playing and texting ability for true computer skills. It is true that some youth have complex computer skills, I just don't happen to know any and I know hundreds of young people through our Church's youth programs including Scouting. I have taught dozens of genealogy classes to huge groups of youth and in every class there are usually only one or two young people that have more than very rudimentary computer skills. Who will move genealogy into the 21st Century? Right now, in my opinion, it is not the youth. Many older people who know very little about computers are impressed with a younger person who can plug in devices and turn on a TV or video game. Big deal. What has that got to do with doing research online? For the time being, the lawyers who don't know computers can still do some law, but not for long. How long will it be before the same thing happens to genealogists? OK, I ran out of time. I guess I will go on with this subject. I am starting a huge scanning project of local cemetery records so I might be a little slower than usual in posting. Can I conserve my own pile of documents? This post continues a discussion about the disposition of huge accumulated piles of documents and related items pertaining to an individual family's genealogy. A comment was made to my last post, expressing some disappointment in my attitude towards repositories. The commentator did note that the responsibility for curation lies primarily with the accumulator of the documents. However, there is also a practical reality involved. For example, if you were to bring a number of boxes of genealogically related stuff to your local Family History Center, you would very likely be told that the Center has no ability to curate the documents or to even store them. Unless your ancestor had some outstanding community standing, it is also highly unlikely that any local library would accept a large collection of genealogically related documents any statements made by the repositories to the contrary notwithstanding. Preservation of these otherwise personal documents lies primarily with the family of the deceased. If the family is not amenable to preservation, i.e. throws them in the garbage can, there is really no one out there who can act to save the documents. If your personal or family papers are deemed appropriate for a repository's collections, and you agree to donate those papers, you stand to gain many benefits. A repository can provide the papers with environmentally-controlled, secure storage and can oversee their proper handling and use. Equally important, it can provide research access to the contents of the papers, both to you and to the scholarly public. In future years, researchers - including students, professors, genealogists, journalists and many others may thus find your papers both interesting and of value to their work. The key words here are "deemed appropriate." I suggest you carefully read the entire article called, A Guide to Donating Your Personal or Family Papers to a Repository. If you read this article carefully, you will see that they suggest shopping around for a repository. In one instance where I donated a sizable collection of documents to a repository, the staff person who met me at the loading dock to accept the documents was obviously not interested in the documents at all, until I spent a few minutes showing him the nature of the documents I had in my collection. He immediately changed his mind and invited me to his conference room where we reviewed the documents for a couple of hours. The collection is now readily available in a large university's special collections library. However, I did not give the documents to the library until I had exhaustively reviewed all of them, extracted all of the pertinent information and made my own digital image of the entire collection. In this case, my relative was the spouse of a reasonably famous person. Had my relative been someone unknown, the reaction would have been entirely different. In a comment, a question was raised about copyright protection for old newspapers. First of all, there is no question that newspaper content is covered by copyright unless otherwise exempt. So what might be the exceptions? I would refer you to Circular 1, Copyright Basics by the U.S. Copyright Office. Newspapers fall within the definition of a collective work. Title 17 of the United States Code, Section 101, states, in part: "A “collective work” is a work, such as a periodical issue, anthology, or encyclopedia, in which a number of contributions, constituting separate and independent works in themselves, are assembled into a collective whole." The procedures for copyright registration for newspapers and newsletters published daily is covered in Circular 62A by the U.S. Copyright Office. For newspapers and newsletters published weekly or monthly, see Circular 62B, Copyright Registration of a Group of Serial Issues. A “work made for hire” is defined as (1) a work prepared by an employee within the scope of his or her employment or Group Registration of Newspapers and Newsletters (2) a work specially ordered or commissioned for certain uses, including use as a contribution to a collective work, if the parties expressly agree in a written instrument signed by them that the work shall be considered a work made for hire. The employer is the author of a work made for hire. The various contributors to a newspaper or newsletter may apportion the copyright ownership as they wish to do so pursuant to the contracts and agreements between the contributors. Generally, this is not an issue because the publisher of the newspaper will extract an agreement from the authors that their works are works for hire and that the publisher owns the copyright. Unless you are positive that a newspaper article is not subject to copyright, you are bound to assume that any published work, whether or not any type of copyright notice is given, is covered by the copyright law. That said, from a practical standpoint, any material published before 1923 is no longer subject to a claim of copyright notwithstanding any written allegations to the contrary made by the publisher concerning the original work or reproduction. But do you really want to get into an argument even if there is a question as to the validity of the copyright claim? If I find an obituary of the Grandfather in the local newspaper is the obituary covered by copyright subsequent to 1923? Absolutely yes. The real issue is whether or not the newspaper owns the copyright. Can I copy the entire obituary for my own private use? There are no copyright police out there enforcing copyright claims, however the original author or the newspaper, whomever owns the copyright, could make a claim that you violated their copyright. The movie, The Day After Tomorrow, depicts the sudden onslaught of an extreme ice age transforming the northern part of the United States into a huge frozen wasteland. Although North America is safe from such a disaster, I am personally facing my own glacial event in the form of growing piles of paper. Recently the paper glacier began growing in several new places in my home, forcing me to take refuge in the last remaining clear space. I am not quite to the point, shown in the movie, where I am burning books to keep warm, but I do eye the recycling container with more than passing interest. As I survey my work area, I note that every flat surface is piled with books or paper and the box count keeps rising. I have piles of boxes everywhere there is a space for them that will not be in the way of traffic. No, I am not a hoarder. I do not intend to die, crushed to death by my piles of old newspapers. As I would say, my piles consist of good junk not junk junk. During the last few posts, I have been writing about paper as it applies to genealogists. This whole topic was started by a four-way discussion I had with two other genealogists and a new-comer to the field. We each had our own take on how to handle the masses of paper that have accumulated over the years. I must admit, I have always been envious of those tidy people who have marvelous filing systems with every document categorized and filed, available in an instant. I think I admire them for the same reason I admire Japanese homes, they are almost completely empty, evidencing a simple lifestyle. Don't Worry Be Happy, as Bobby McFerrin sang. If you fret about the piles, you will only end up fretting. Unless you end up with a monumental amount of free time, nothing is likely to change. Make peace with the paper. Don't look at the piles as enemies but as friends. They are evidence of the huge amount of work that you have either done or are going to do. Put as much into the computer as is humanly possible. Digitize everything. Add metadata to your images so you can find whatever you are looking for. Attach digitized copies of your documents to the individuals in your genealogical database. Realize that you are not going to throw out all those historical documents and live with the realization. Here is the point, there is unlikely to be any paper filing system, absent the space and resources of a document repository with a paid staff, that will adequately take care of a glacier's worth of documents. Fortunately, we can simply and easily digitize everything and let the computer do the organization. Realize that scanning a document and then failing to add metadata, proper file names and whatever, is just like moving a document from one pile to another. Don't think you will "get through" with organizing your files. There is no end, so live with it. As we used to say, life is hard and then you die. But the fortunate thing is that you can pass on a legacy if you choose to do so. Take advantage of free online services such as WeRelate.org to "store" your research and document images. There are hundreds of online options, but you need to be realistic about sinking your time into a subscription site. Will you heirs pay to keep the site open? Think about it. Use a non-profit foundation instead of for-profit company and you will have a better chance at saving your work. Hopefully, someday, FamilySearch.org will get its act together and we can use what ever the descendant of New.FamilySearch.org turns out to be for the same purpose, preserving priceless research. The dilemma is that genealogists are deciding that their research efforts are ended when they run out of online sources. Many researchers just don't want to make the effort to go to a specific repository to find paper records. Now comes the dispute. What to do with the paper records once you have them in your possession. There are more than a few very hotly held positions on this issue. In one corner, we have the genealogical hoarders who shudder at the thought of anyone disposing of any scrap of paper or other material object even touched by an ancestor. They keep old electrical bills, grandma's junk mail and a complete series of their uncle's TV Guide. In another corner are the "I don't care who owned it, it is junk" contingent. They through away original marriage licenses, birth certificates, stock certificates, gold certificates and anything else they can get their hands on. No matter what the genealogical value, it is off to the trash heap. Yet another corner is inhabited by the digitizing wizards. They scan everything they can get their hands on. They scan everything the hoarders have in their piles and then they don't care what happens to the original paper. The other corner of this controversy is governed by the "I have an unbeatable system for filing" party. They have the wisdom to know exactly what is important and will be important to future generations. Everything they keep is in color coded, polyethylene protective sleeves in acid free containers with humidity control. In the middle is the poor genealogist who has yet to join one of the parties and is confused by the differences in style and substance. All of these various positions are adamantly defended by their interpreters. They think they are right and everyone else is wrong. Let's think about this dispute in a rational way for a few paragraphs. Let's start with a birth certificate. When I am alive, I might need my original birth certificate for any number of reasons. For example, a birth certificate is one of the documents you might use to apply for a passport. What good is the original birth certificate once a person has died? The answer depends entirely on what you know or do not know about the person on the certificate. If you are trying to prove your entitlement to an estate, a birth certificate of a deceased person might be a valuable document. From a genealogical standpoint the document likely has no sentimental value and once the information is properly recorded and the document is scanned for future reference there may be really no use for the original document at all. I have seen very few framed birth certificates in my life. On the other hand if you have a handwritten letter from your Great-grandfather to his girlfriend, soon to be his wife and your Great-grandmother, you may treasure the original but would still like to see the document scanned and distributed to the other grandchildren. Oh, I forgot to mention the other corner, the one outside the ring, this corner is inhabited by those people who own everything and cannot bear the thought of anyone touching their ancestor's documents or even looking at them. They usually have no idea whether or not the documents are important, but they are sure not going to let anyone else have them. How would you like an original will in which the deceased listed every member of the family including all the in-laws with their names and relationships. What is the document worth once you enter all of the information and relationships into your computer? So, here you have it. The real dispute. Whether the paper documents are of any real value after the information contained in them has been correctly and completely recorded? This dichotomy pervades the whole of genealogy. On the one hand the preservationists in whatever guise maintaining their paper copies and on the other the informationalists sucking out the information and discarding the rinds. Strangely enough, some of us may have both traits. We may be obsessed with digital preservation but have no intention of ever disposing of the original documents. I have heard it said over and again, I would rather hold the document in my hand than see the faithful reproduction on a computer! But at what price. It is one thing to harbor a few documents, but what happens when the number of documents grows into the tens of thousands? Who among us, other than the institutions has the resources to adequately preserve thousands upon thousands of documents? And what will our heirs do with our monumental piles of paper? Stay tunes for another exciting episode. Genealogy is all about paper. Some societies have relied on oral histories to transmit their genealogy, this was very effective, but had the tendency to ignore collateral lines and multiple children. I still see many pedigrees that follow one line with only the direct line child/ancestor listed in the family. Since computers are a very recent innovation, any genealogical information we have in our Western European based society is paper based. The computer revolution has affected genealogy by making a very small percentage of the previously all paper documents available in electronic digitized format. Unfortunately, the documents that have been digitized are the most used for genealogical reference, unfortunate because the impression given to the genealogical community is that the rest of the paper documents do not need to be consulted. I am fully aware that there are huge paper based genealogies in other parts of the world but relatively very few of these resources have yet to find their way to computer files. Every week I see the same phenomena, I am talking to someone who is relatively new to genealogy and has been searching online for sometime and found a significant number of digitized documents. They discover that they are missing one or more important "documents" that will extend their line one more generation. Searching online has failed to produce the desired documents and they come to me wanting help in finding the documents they think they need. After I confirm their online search, I say the same thing (over and over it seems) "Not all documents have been digitized, you need to go to _________ (fill in the blank) and see if they have what you are looking for." You can fill in the blank with National Archives, Family History Library, Library of Congress etc. Just a few short years ago, this suggestion would have resulted in a search of the Family History Library Catalog and a microfilm order. Today, the reaction is one of disbelief and skepticism. What, you mean I actually have to go somewhere or do something to find my ancestors? I am not exaggerating this issue, time after time, they simply stop doing any more research. That's it, I'm through. I am not talking about the core of diligent genealogists who travel the world and visit repositories on their vacations, I am talking about the computer users who have forgotten the world of paper. There are freely available paper document collections right here in my home town that have never been used for genealogical research to my knowledge. I know of one extensive collection of on paper death records going back over 100 years which I have mentioned to dozens of local genealogists who had no idea of its existence. These records are far, far, far from being digitized. The attitude I see almost every day, I will just wait, it will all be on the computer soon. In one instance lately, I told the researchers that the information they were seeking was likely to be found in newspapers published in the county where their ancestors lived. I even pointed out that there were three or four newspapers that had been published in that same small county during the time period when their ancestors lived in the county. The reaction was interesting. They were simply not interested in my information. They had no intention of traveling to a remote state to search university and state archives for copies of the newspapers, even when the Library of Congress listed the exact coverage of the local collections. I have another research project right now, that I am certain will end up in the same way. I will tell the people that the records are in the National Archives Branch in an adjoining state and they will say, oh dear, I guess that research can't be done. There was an account in a newspaper recently where a family's 100 year old genealogical "mystery" was solved when a researcher went to the record repository in England and actually looked for the paper record. Surprise. This is the dilemma. We have thousands of books in the Mesa Regional Family History Center. I would guess that less than 10% of the patrons have ever looked in a book for information about their family even if the book were digitized and online. The rest of this story has to do with what happens to the paper records we end up collecting as genealogists. Do we keep the paper once the documents have been digitized? Do we make paper copies of the records we have on our computer? Tune in for the next installment. Google+ has moved further into the world of social networking by opening up business pages. I have put up a page but am still puzzled about how it all works. You can see my page at Genealogy's Star. I have yet to figure out how to update my profile or add content, but I am sure that will happen shortly. The standard method of recording events, from a genealogical and geographical perspective, is to record the name of the location of the event at the time the event occurred. After I assumed that everyone understood this convention in a recent post, I received an insightful and interesting question from a commentator, how do you indicate that the name of the place has changed? The question seems to call for a simple answer, but upon reflection, the answer is anything but simple. I was recently looking for a location and found the place name in the extensive United States Geological Survey (USGS), U.S. Board on Geographic Names database. It turned out that the location was a post office that was only in existence for about six months back in the 1850s. Obviously, a reference to this place name would be just about as puzzling as listing the person born in a town before that town was established. So what do I do? Most of the programs available for storing genealogical data today have a way to attach a note to a specific event. In the case of the name of a place changing, the history of the name changes should be recorded in the notes attached to the event in question. Some of the available programs have a graphic way to indicate that a note is attached to a specific fact or event. This type of notation is particularly important if the place has changed a number of times, such as county boundary changes or towns that have changed hands several times due to wars or other political upheavals. One example where I frequently find the problem of applying the latter jurisdiction is in deaths of pioneers on the Plains. Nebraska became a state on March 1, 1867, but I commonly find Nebraska listed as the place of death for pioneers who died before that date. The reason for the rule is quite simple, records follow or are found in the jurisdiction where the event occurred. In some instances the records may have moved several times depending on jurisdictional changes, but if you ignore the starting point, i.e. the place where the event occurred, you may never be able to follow the trail. What is also commonly overlooked, is that you may need to search in all of the historical jurisdictions, not just in the one where the event occurred, but in each succeeding jurisdiction until you are convinced that you have searched appropriately in each jurisdiction. In some of the Eastern seaboard states, a town may have been in multiple counties, any one of which could have the records you are looking for depending on whether the county sent the records on to the new county or kept the records in its own repository. The other side of this rule is don't assume that the location information recorded in someone else's file is inaccurate merely because you think the county is wrong. I very well could be wrong, but you need to check out the location of the town at the time of the reported incident. As Joe E. Lewis is supposed to have said, "You can lead a horse to water, but if you can get him to float on his back, you've got something." We can talk and talk about citing the name of the place at the time of the incident or fact, but I can probably find a number of counter-examples from my own database. Also, be care of standardized place names. Standardized anything in genealogy is probably a very bad idea if it means losing information in the original. One way to tell if someone is tech savvy is to see what browser they are using. If you look at their computer and it opens to Internet Explorer in default mode with no customizing then you can guess that this person does not know much. Hmmm. That sounds overly patronizing doesn't it. Like "I am superior because I know how to use a browser and you don't." Patronizing or not, I cannot tell you how many people I have found who use Internet Explorer because it came with their computer and they have no idea that any other browser exists. Perhaps you can measure how hyper tech you are by how many different browsers you have on your computer and actually use? OK enough of fake superiority. There are some pretty dramatic changes going on in the browser world and the changes may be affecting your blog, your data files online or some other part of your online world. I started to think about this when I was notified by Mozilla's Firefox, that yet another upgrade was available, Version 9.0. If you don't know, you can check your browser's version by either going to the file menu on a Mac and looking at the About... link or going to the Help menu in Windows and looking at a similar About... link. There are a number of websites that are tracking the popularity of the different browsers. Both Safari and Opera, although on the list, have relatively small market use percentages. The market is really divided somewhat evenly between the three large browsers. However, Chrome is steadily gaining ground on the other two, both of whom have been losing ground over the past three years or so. The sites differ in their statistics, but all of them show Chrome above 30% market share. I don't care for Internet Explorer and have been using Firefox for a long time, but I am using Chrome and after getting used to some of the differences can see why it is gaining market share. What we find as we are editing the FamilySearch Research Wiki, is that there are different formatting problems with each of the newer versions of the browsers. Google is slowly (or not so slowly) integrating its programs and that tactic may inevitably make Chrome the winner in the race for the most used browser. This last week I had to shudder after talking with one of the volunteers at the Mesa Regional Family History Center. She explained to me that working with one of the newer genealogy programs, in this case RootsMagic, was just too much of a bother and she was going back to using Personal Ancestral File (PAF). I really was at a loss of what to say. I didn't know the person well enough to say what I was thinking. I guess I was so upset that I had to wait a while for my thoughts to coalesce. The fundamental problem I see with PAF, among many others, is the inability to adequately edit the entries. Many of the newer genealogy programs, such as Ancestral Quest, RootsMagic and Legacy Family Tree, just to mention a few, have powerful tools for editing the content of the database. Although in every program some of the features could be better, all of the newer programs have features that go far beyond PAF in managing the data once it is in the file. It is this data management function that is obviously being ignored almost completely by the obdurate PAF users. Here is what I am talking about. I will use my own family line data file from New.FamilySearch.org as an example. Let's first look at place names. This is a list of the variations for one geographic location on New.FamilySearch.org. (I have talked about these variations in other contexts in the past, mostly to show the problems with New.FamilySearch.org). See Barnes, Will C., and Byrd H. Granger. Arizona Place Names. Tucson: University of Arizona Press, 1960 and about a hundred other references. Now about the county. In 1876 when the town was established, most of northern Arizona, including Allen's Camp, was in Yavapai County. Yavapai was split and Apache County was created on 14 February 1879 putting St. Joseph into Apache County. A later split on 21 March 1895, put St. Joseph into Navajo (the correct spelling) County where Joseph City lies today. So my Grandfather was born on 12 January 1895 in St. Joseph, Apache, Arizona, United States, the first entry and all of the others are simply inaccurate or in case of the one with Utah, wrong. The problem is that any database that has not been carefully reviewed will contain many, sometimes all, of the variations in name and place illustrated above. How do you know this is the case if you are using PAF? You don't. You are blissfully ignorant of the variations. Do you see the problem with the variations? Imagine if this individual were the end of your line. Do you think any of these variations, if they happened to be the one you had in your file might cause some research problems? How long would it take you to determine that your relative was not born in Utah, for example? This issue is trivial in Arizona but might cause all sorts of problems in England or Denmark or where ever. Now, here is the point. If you are using PAF (or another program with the same limitations) you may not even be aware of the variations. I repeat, most of the newer programs have a relatively simple way of editing the information, such as geographic locations, in your data file. I attribute these types of variations, not just to bad genealogy, but also to the lack of adequate tools. Perhaps you can see why "going back to using just PAF" makes me shudder. I hope she isn't working on my line. Geniaus Blogger, Jill Ball asks us all how we start our morning tech routine. I know few bloggers in the world who have a better feel and understanding of genealogy tech than Jill Ball. So I was very interested in learning about how all these wonderful blog posts come about. Not so different than the rest of us, I find out. My schedule is probably not the envy of anyone. I usually get up at 6:00 am local time in Arizona. Probably so time in the afternoon or evening in Australia, and the first thing I do is turn on the computers. I immediately start through the dozens of email messages that have accumulated over night and during the afternoon when I am getting behind on email. I then check all the messages stacked up in Skype. Moving on, I start into the blog reader. Usually, there are no less than 20 to 30 posts since I signed off about 10:00 pm the night before. I then start answering email, responding to Skype questions and generally coming to grips with what is going on in the world. While getting ready for the rest of the day, I check the world and local news on my iPhone and look at more email. (I can see you are all envious already). I then get down to business writing. I update the blogs and process photos for my photo blogs and then write my TechTips posts. Then it is off to writing on my next book. With short stops for meals I try to keep at writing until around 8:00 at night. During the week, of course, I spend time teaching classes and helping patrons at the Mesa Regional Family History Center and sometimes have to take care of other things, like fixing cars, buying food, you know the stuff you do to keep alive. Some days I feel like I have made some progress some days I don't. Almost every week, I have genealogical mysteries to solve and other activities mostly Church and Boy Scouts activities. Sunday is mostly Church related activities, although I help teach the Family History class during Sunday School. I guess the key to keeping up with the kaleidoscope of the tech world is just constantly being online either with a computer, laptop or iPhone. This last few weeks, I have spent a lot of time writing syllabuses for the upcoming Genealogy Conferences. Tomorrow I will start writing all over again. Last evening we had an hour and half long online chat with the Bloggers for RootsTech 2012. With such a tremendously broad field of interests, I began to think about communicating with such a diverse group even though we all apparently share a common interest. As I thought some more on the subject, I began to wonder exactly who are all of these genealogists and do they really have anything in common. I have had a couple of posts and there have been others, discussing the so-called "community." Can you be a member of a community when you don't even know that the community exists? Can you be a member of a community that has no real definition? What describes the stereotypical genealogist? A 60 year old+ woman who is the repository of family stories and history? A college educated professional with advanced degrees who writes for genealogical journals? I was in my 30s when I first began slogging away at building a family tree. Are we old just because we have been doing genealogy for a long time? If you look at the demographics of my blog readers from Alexa, just for an example, relative to the general Internet population, I am far less popular in the 25 year old to 45 year old age group and much more popular in the over 55 years old group of Internet users. Not much of a surprise. Again in the general Internet population, I am much more popular with those who have some graduate school education, slightly more popular among males than females, less popular with users that have children, more popular at work and less popular at home, very much more popular with high income groups, especially those make more than $100,000 a year, and Genealogy's Star is heavily into white Caucasians. Comparing the demographics of Genealogy's Star to FamilySearch.org is interesting. I am more popular than FamilySearch among African Americans, Asians, Hispanics, and MiddleEastern populations. I am a whole lot more popular with those who attended graduate school, my readership is predominantly male, while FamilySearch.org seems to be dominantly female. Genealogy's Star has the same popularity with FamilySearch.org for families with or without children, but FamilySearch.org is used predominantly at home while my readership is at work. Education: Genealogy's Star still shines much higher in the graduate school crowd. Ancestry.com and FamilySearch.org have about the same educational level audience. Gender: I have a male readership, both Ancestry.com and FamilySearch.org are predominantly female. Children: Ancestry.com has a slightly higher percentage of subscribers with children. Browsing Location: Ancestry.com is used in the home, my readers seem to prefer reading me at work. Income: I cater to the high rollers. Neither FamilySearch.org nor Ancestry.com have anything close to the predominance I have among high income readers. Ethnicity: FamilySearch.org and Ancestry.com have the same spread of interests except Ancestry.com attracts more African Americans. I am reminded of a comment by one of the volunteers at the Mesa Regional Family History Center in his upper 60s who was lamenting the fact that he didn't have time left in his life to learn all this stuff. So think about it. Even though the bloggers on the Internet last night were mostly older as opposed to 20s and 30s, don't we have to realize that experience in genealogy takes time and effort and no one can be expected to have that level of experience unless they started quite young? How long does it take to become competent in genealogy? On the other hand, how may genealogists are bloggers? I don't mean how many bloggers are there, but overall what percentage of genealogists are online sharing family stories, lineages, support, technology and news? Do all of the people who have subscriptions to Ancestry.com qualify as "genealogists?" Age: Definitely over 45 years of age. Education: Definitely higher education. Even though Genealogy's Star's demographics were decidedly to the graduate school level, both Ancestry.com and FamilySearch.org have markedly more upper education viewers. Gender: No conclusion. But I suspect a lot more women than men, just by observation. Has Children: Having children seems to be a disincentive to doing genealogy. Browsing location: Really doesn't tell us much. Income: Genealogists have a higher to much higher income than the average. Ethnicity: Again, not much here that helps define genealogists. Of course, if you are a 14 year old in high school reading this Blog, you may disagree. Since Ancestry.com has decided to release a new updated version of their popular Family Tree Maker program for the Macintosh, I decided to bring everything up to date with the Family Tree Maker 2012 installation problem. First, some comments about Family Tree Maker in general. Family Tree Maker, on both the PC Windows based computers and on the Macintosh, seem to be good fundamentally sound programs with the added attraction of connecting directly to Ancestry.com. The first problem is that if you happen to have the Mac version you cannot share or update files in the Windows version. Although the two programs are made by the same company, they won't share files. You would be forced to use GEDCOM to move the data. I was initially attracted to the Family Tree Maker 2012 updated program by the claim that you can share data between your computer based program and your online Family Trees on Ancestry.com. That is true and it works quite well, although getting the same documents online and into your computer-based program file can be difficult and a challenge. The bad news was, I was expecting to be able to synchronize my FTM 2012 file on my laptop with my desktop computer. No such luck. The program is written so that you can only synchronize one program on one computer with the online Family Trees. If I try to synchronize my laptop, I get an error message and the ability to create a new tree online. So far, there is little information about the Mac 2012 update, but I am assuming that it will support only one connection to the online Family Trees and will still not share data files with the Windows version. I am simply amazed that anyone, even Ancestry.com, would release a program in today's online world that does not share files between different versions of the same file and even the same files on a user's laptop and desktop computers. Some of you out there are Mac users and are having trouble installing the FTM 2012 version of the program on a virtual PC running under Parallels Desktop. I hesitated to give out the solution because of the lack of support from Ancestry.com on the issue, but I have reconsidered. The answer is relatively simple, copy all of the installation files from the CD to your Windows program on your Mac and run the install from the computer, not the CD. That did it for me, although you may have another problem not resolved by simply copying the files over. I guess I have decided to “hit the conference circuit” as they say (I’m not really sure who says this, but anyway). I will be presenting at a Webinar and 5 Conferences in January and February. I start off the year on January 4, 2012 with a Webinar called, “Digital Books and Sites for Genealogists” for Legacy Family Tree’s Geoff Rasmussen. Geoff hosts an amazingly popular series of online webinars. You can register now for this interesting informative one hour+ webinar. The following week, I will be in Yuma, Arizona, a very nice place to be in January. On January 14, 2012, the Yuma Family History Center is sponsoring a one-day conference. I will be giving the keynote address for the opening and teaching two classes. The next week starts off with another conference in Yuma, this one sponsored by Family History Expos and the Yuma Genealogical Society on January 17, 2012. I will present two classes at this one-day conference. It remains to be seen how much blogging I can do in a one day seminar. But I will at least give everyone a recap of the events. That weekend, on January 20 and 21, 2012, we will be in Mesa for another Family History Expo, Arizona Family History Expo 2012. I will be presenting two more classes and keeping everyone informed with my blogging. Jumping to February, I will be back up at RootsTech in Salt Lake City, Utah on February 2, 3 and 4, 2012 as both a presenter and a featured Blogger. I expect that there will be even more people at this huge conference. The last time I checked the site, they had plans for over 100 presentations over the three-day conference. RootsTech is the have-to-go-to conference of the year. I will be blogging merrily away all during the conference. My current list of conferences winds up on February 24, 25 2012 in sunny St. George, Utah for another Family History Expo, St. George Family History Expo 2012. I am presenting two more classes and participating on a panel. Last year the weather was really nice in Salt Lake for the first ever RootsTech Conference. We can’t expect anything but good weather and warm sunny skies in Yuma, Mesa and St. George. If you need a break from snow, sleet and cold weather, come to our nice warm and friendly (and informative) conferences in beautiful Arizona and Southern Utah. Of course it will be cold in Salt Lake in February, but the Conference is all inside the Salt Palace. If you attend any of these conferences, please take the time to meet me and introduce yourself. Who knows, I may venture out of the sunny south to other conferences next year, if the weather ever warms up. Advanced 3D system used for shooting "The Hobbit"
Siri won't talk to me!